SMTP Mail Sender is an application that allows you to send messages through an SMTP server. It lets you send messages if you do not have a mail application installed, or need to send from an account that is only used for sending messages without worrying about responses. It also runs from a USB thumb drive, so you can send emails from anywhere you have access to a computer with Internet access. Graphical user interface (GUI) instead of the run of the mill command line applications. UI allows customization by showing/hiding fields as necessary. If you need a true command line application that does not display a user interface, I highly recommend Blat. Sends plain text messages to minimize bandwidth used for processing the messages as they travel across the Internet. Send messages automatically from a script using command line parameters. A GUI dialog will still pop up when automatically sending the message. Want to use SMTP Mail Sender in a different language? Check the comments below to see if someone has already provided a translation. If not, and you want to help translate to your local language, provide the translation via this template for others to use in the comments section. Have a few moments to spare? Please rate SMTP Mail Sender at the SnapFiles website! SMTP Mail Sender requires the Microsoft .NET 2.0 Framework. Supported/Tested Operating Systems: Windows® XP SP3, Windows 7 Home/Pro 64bit, Support on Windows® Server is limited to GUI mode, it cannot be run in Service Mode at this time. Lost and confused? Check the frequently asked questions page. What do you think about SMTP Mail Sender? Rate it! Pretty cool utility. It would be very useful to see the negotiation process while the software is talking to the SMTP server and any errors generated from sending. What do you think about adding some functionality like that? It happens I can’t launch your utility from my computers (windows 7 pro or windows 10 pro). It just displays “The program has stopped working”. Simple, only one exe, no install – wonderful. Had problems with not working powershell script Send-MailMessage in windows 10, but this one successfully send a mail at the first attempt. I’m impressed! Windows 10 x64, 1803, no mail client installed, document scanner attached. There is no mail account, just a valid SMTP server on LAN with proper sender email address. Can not create this association, as SMTPmailsender is not listed there, and there is no possibility to browse/search one. Is there any way to set SMTPmailsender as a default mail program in windows 10? This is probably a total fringe case, but would it be possible to have a switch for the program to send as an HTML(-html or -BodyAsHtml or something? ), even if the editor doesn’t support rich text and HTML? One service I use assumes that the body of a non-HTML email is itself an attachment instead of the body of the original message. Its not a significant issue but would be helpful. Unfortunately, it’s not currently possible. I’ve looked into this to try implementation of HTML email per the requests of other users. The email library that is part of the .NET framework does not seem to support HTML emails, even if you define the content-type header as text/html. The problem is that just defining the email as html does not work, you have to actually MIME encode the entire message. 🙁 Supporting HTML email would require using a completely different library, possibly requiring a complete rewrite of the application. Would it be possible to have a command line switch to specify the address book file being used? Hi Pierce! Yes this sounds like a useful addition. I will add it to my request/bug tracking. Thanks for the suggestion. Version 1.0.0.21 now supports the -addbook “file” parameter to allow you to specify which address book file to use. See the readme file for information. Great software. I have one doubt though. I tried Gmail and Yahoo to send mail via port 587 and succeed. However, I failed if I use port 25(ssl not ticked) or 465(ssl ticked). But I have one doubt. I tried both Gmail and Yahoo to send mail via port 587 and succeed. However, I failed if I use port 25(without tick SSL) and port 465(tick SSL). It seems like only port 587 works. You are correct in your findings. Gmail and Yahoo both only support port 587 for submitting email from individual clients. Port 25 is generally only allowed to accept mail from other mail servers. Port 465 at those services requires full protocol encryption, but SMTP Mail Sender only supports TLS encryption. I should update the application to label it as “TLS” instead of “SSL” in the configuration settings to avoid this confusion in the future. HTML support would also be appreciated. Thanks for the reminder to release the newest version. The change was made in the code, but I never released the build to the wild. Version 1.0.0.21 should now read TLS instead of SSL. It also supports specifying a non-standard address book file location using the -addbook “file” parameter. See the readme file for information. When the “Keep open after sending” box is ticked the first message I send goes fine, but subsequent messages don’t. If I then close and reopen the app the first message goes fine but once again subsequent ones don’t. This is 100% repeatable here. Thank you for the report. I can confirm that it is doing it to me as well. I will look into this when I get a few moments and see if I can figure out what is causing the problem. I’ve posted a new version of SMTP Mail Sender that fixes the problem you were experiencing. Download the latest version from this page for the fix. I am not sure what you are asking. Do you need help using SMTP Mail Sender, or do you need help learning the simple mail transport protocol? HI, great software! I need to know if is possible to add all the email address in the Address Book directly without selecting one by one. Thanks! You can add as many as you want there, and they’ll be loaded the next time you launch SMTP Mail Sender. And now, after the update I can say ALMOST PERFECT! Only two things: the download links show version 1.0.0.16 but the correct one is 1.0.0.18 and I’ve a little problem with the gui, the envelope icon and the “Settings” button are cutted, while the new options is perfect. I’ll send you a screenshot via email. 3/29/2017 11:26:08 AM	Syntax error, command unrecognized. The server response was: << — And then the mesaage stops. What is the response ?? 3/29/2017 11:29:20 AM	Failure sending mail. << — Nothing is said what kind of failure. What is the failure ? There aren’t any more log files, this is the only one. Those error messages you are receiving are coming directly from the mail server. The application just writes the error message to the file along with the time stamp. For Gmail, please try port 587 instead of 465. Gmail expects the full transaction to be encrypted on port 465, but it uses a feature called STARTTLS on 587 to accept email. 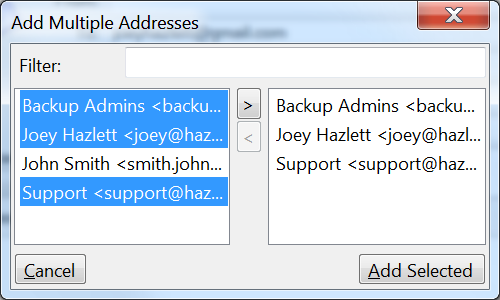 SMTPMailSender uses some built-in .NET functions that do not fully support encryption of the entire connection, so each command is encrypted instead of sending plain text over a completely secure tunnel. Due to that, Gmail is expecting plain text and receiving an encrypted command. I do not have any experience with Office 365. The first thing I’d try is to just disable SSL. I agree it’s hard to troubleshoot further when the remote server gives such a vague error, but there’s not much more SMTPMailSender can do other than report what it was told happened. I’m just speculating here, but is it possible that you’d need to enable SMTP access for your O365 account? Some webmail services do not allow submission of messages from remote hosts without prior authorization, to combat spamming. Hopefully my thoughts will help you get SMTPMailSender working in your environment. I can use it fine with my ISP smtp but doesn’t seem compatible with Gmail. I’ve tried it with 3 gmail accounts and it doesn’t send, gives error saying “syntax error: unrecoqnized command” in the log. I’ve been using port 465 which Google says to use with SSL. So instead I gave 587 a try, and it worked. I’ve tried 465 using separate ISPs too. Perhaps its being blocked. Thanks for making such a useful tool, much appreciated. This is a great software. Please when will you include the HTML formatted body functionality? There is no immediate plan to include HTML formatted body functionality. It is a simple tool for Windows systems that was designed to send one-off emails, mostly for reporting when processes complete. If you need capability such as HTML formatting, I suggest moving up to a standard email client like Mozilla Thunderbird. There are portable versions available, which will let you run it from a thumb drive, replicating most of the features in SMTP Mail Sender and then some. Hal9000 has a great suggestion. I’d like to add, can we use encryption inside or outside this fine app so we can sidestep any looking on my gmail? In regards to Hal9000’s suggestion, there are CC and BCC fields available for use in SMTP Mail Sender, and have been since version 1.0.0.10. If you do not see these in your version, you may need to download the latest version from this page. As for encryption, you can enable SSL, but that only encrypts the traffic between your computer and the Gmail servers. Once it has completed that step, you have no further control over who does or does not see the message, that’s under the control of the email provider. Yes it is possible to call the application via a batch file. Please check out the readme.txt file included with the release of the program. 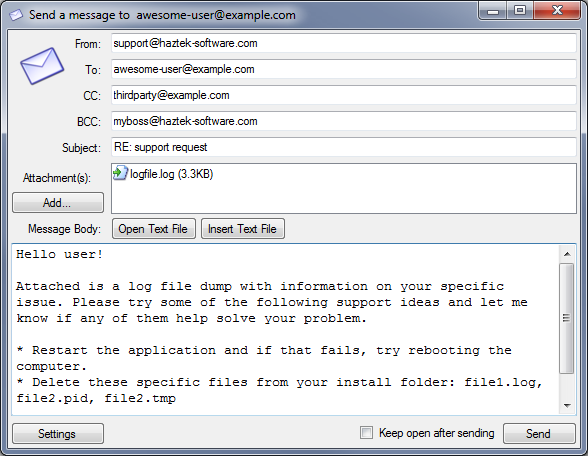 If you have not received the entire zip file including the readme file, grab the latest version from http://www.haztek-software.com/files/SMTPMailSender.zip. What would really round it off would be a return code confirming a send or escape. Can someone tell me, why it won’t send my emails?! I’ve tried all sorts of servers, from Hotmail, Gmail, etc, and the Emails never arrive… Does it connect to a certain IP, that my IP Blocker might be Blocking?! Your ISP may block outgoing mail on SMTP port 25. If that is the case, you will want to configure it to use port 465 and enable SSL. I’ve never tested with Hotmail, but I know that it will work with Gmail and Yahoo, as I’ve used both of those before (and still do). Thanks a lot for the freeware that you offered and your effort given. I would like to propose to add a CC/BCC field. Thanks Joey for all the free software your are offering. I enjoy using StoreURL and Networx every day. I am delighted. I hope helping you with this French translation of the SMTP Mail sender. I have a 10 years computers and telecoms engineering background as well as being a Quality Auditor and ISO 9001 Certifier. Don’t hesitate contacting me If I could be in any help for your future projects: (Auditing, Beta Testing, Analysis, etc…).